The architectural firm IL LABORATORIO is founded in January 1986 by the engineer Roberto Lasi and the architect Roberto Mancini in order to structure a working relationship that began since the early 80s. Over the years the firm has undergone several organizational changes with the entry of new members for the purpose, primarily, to adapt IL LABORATORIO’s professional reality to new clients expectations. However the firm, although compressed by the rigid grid represented by proper planning and professionalism, has managed over the years to create a space within significant ideas expressed both in the new construction of the restoration, renovation and interior architecture. 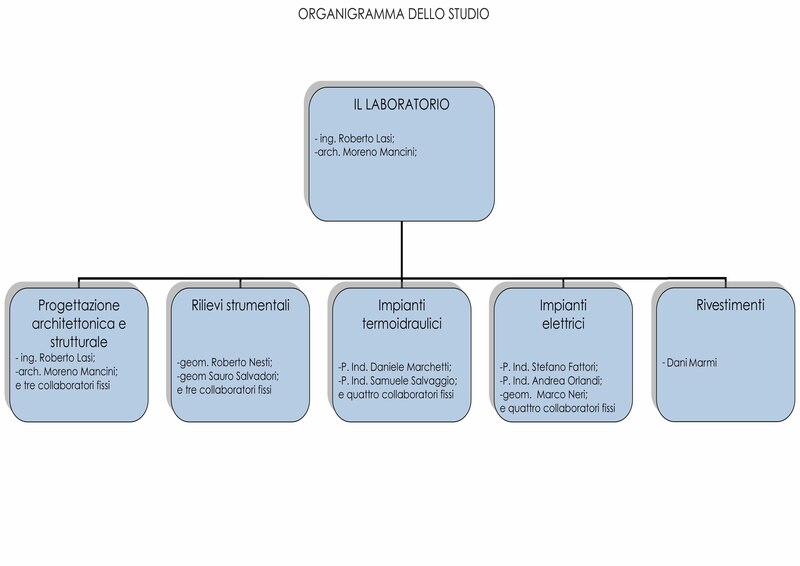 And ‘witness to this, here is the rich biography of the founding members of the firm IL LABORATORIO. Moreno Mancini was born in Cerreto Guidi, in the province of Florence, in January 1953. In 1979 he graduated in Architecture at the Faculty of Architecture at the University of Florence, with the assistance of professor Remo Buti, with a thesis guided to the recovery and reutilization of an old artifact of industrial architecture located nearby Florence. In the same year he obtained the qualification for the free profession and participated in the census, on behalf of the Superintendent of Environmental and Architectural Heritage of the provinces of Florence, Pistoia and Prato, the existing industrial archeology in the province of Florence. After a worthwhile relationship lasted for several years, in January 1986 founded, with engineer Roberto Lasi, the firm IL LABORATORIO. He works freelance, dealing mainly in residential architecture in the various meanings of restoration, renovation, interior design and new construction. He lives in Vinci, the town that gave birth to the great genius Leonardo da Vinci. Roberto Lasi was born in Empoli, near Florence, in April 1946. He graduated in engineering at the Faculty of Engineering at the University of Pisa in 1971, the same year he obtained the qualification to the profession and undertook educational activities, as a volunteer assistant at the Faculty of Architecture at the University of Florence. He also followed the qualification required for teaching in secondary schools where, for many years, he taught courses in topography. At the same time he devoted himself to the profession of public and residential building design, and calculation of concrete structures. In January 1986, with the architect Moreno Mancini, founded the firm IL LABORATORIO, to seal a collaboration that began even before. He lives in Empoli, the city that gave birth to the great artist Jacopo Carrucci, known as Pontormo, where he carries out his activities mainly aimed at professional urban planning, architectural and structural engineering. GEOLASER 3D comes within the professional association of Robert Nesti and Sauro Salvadori, following the specialization acquired in the field of geometric detection, three-dimensional topographical and over twenty years of activity. Nesti and Salvadori operating since 1991 as associate professionals. The firm is involved immediately in surveying and architecture field in every feature, using a total station, and aimed mainly at morphological surveys, leveling, tracking and tracing of buildings, and land registry. Then the firm expands its specialization, the equipment used is integrated with a motorized total station and GPS systems, making surveys and leveling of villages, roads, rivers, quarries, landfills etc . ; monitoring of landslides, landfills, artifacts etc . ; using appropriate hardware and software that provides depiction of terrain, integrated contour lines, sections, calculations of areas, volumes etc .. In years of activities, the study also had the opportunity to acquire high expertise in the field of accounting in public works accounting, building practices and real estate valuations. In the last period the study approached the laser scanner technology by purchasing a tool laser scanner RIEGL LMS-Z420i (in 3D scanning at a minimum distance of 2 meters to a maximum of 1200 meters and precision of 1 cm) complete with software further processing. This technology allows you to digitally capture 3D objects, buildings and artefacts of any shape and size (eg . : quarries and landfills, mudslides or landslides, bridges, dams, both outside and inside buildings, streets, squares, monuments etc.) in a very short time by measuring millions of points in 3D. In matters of versatility and accuracy of the results we obtained, this technology is currently the most used by the studio especially for particular relieves of a certain consistency. The use of laser scanner technology has enabled the studio to get some prestigious positions in collaboration with the faculty ‘of the university architecture’ of Florence (Laboratory GECO – “Geomatics for storage and communication of cultural heritage”), including : laser scanner relief of the Campo square and Mangia tower in Siena, relief LS castle emperor in Prato, relief LS park of Villa Demidoff in Pratolino (FI), LS relief gray hollow Monsummano (PT). The technical study is therefore concentrating their interest on this technology trying to improve performance and development of reliefs and graphics quickly and at low cost. Some external technical specialist actively cooperate with the firm. The technical study is operational throughout the year including the month of August. close synergy. The company has given birth to a Research and Development department that selects and proposes innovative and exclusive materials, displayed in the exhibition space next to the factory. Dani Marmi’s collaboration with important Italian companies and hotels, both national and international, has allowed it to gain experience in technical services, thus being able to come up by the side of very important designers. Design and management of projects aimed at the functional optimization and energy saving, testing technical amministraivi, advice, expert reports, oversee the works and site assistance, technical and economic accounting, economic analysis and financial investment, instrumental checks, training. Electrical systems, are fed and distributed on average, low or very low voltage, lightning protection systems, systems of supervision and remote control systems, Building Automation, home and industrial automation, manual or automatic extinguishing fire systems, fire detection systems, closed Circuit TV systems, Ether and satellite TV systems, voice intercom systems, telephone and telematic systems, burglar alarms and access control systems, lights & effects sistem for places of public entertainment, video-projection and conference calls via ISDN lines, simultaneous translation and what is necessary to “Conference.”, sound systems for commercial and public entertainment venues, solar photovoltaic systems. The professional association “Termostudio” was established January 1, 1999 between the experts industrial surveyors Neri Marco, Fattori Stefano and Andrea Orlandi. The Industrial Experts Neri Marco and Industrial Expert Stefano Fattori were independent professionals for years, while the Industrial Expert Andrea Orlandi was faithful collaborator of the Neri firm since 1991. Activities of the study: the main activities of the study are those of designs, construction supervision, testing, estimates of heating, cooling, air conditioning, production and / or distribution of steam, hot water, thermal oil, compressed air, gas ( combustible and non-) etc. Also are carried out by the study practices for approval PED and INAIL pressure systems, reports 10/91 and dec. Leg. 192/05, practices for tax breaks and loans (relative to thermal plants), fire prevention practices for obtaining permits and Certificates of Fire Prevention.